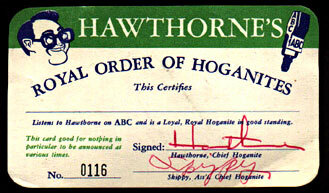 Here is an extremely rare original membership card for the Royal Order of Hoganites! Fans got this after writing in to his ABC show. Notice it's signed by both Hawthorne AND Skippy! Thanks Jim, for sharing this priceless piece of hogan history! If you've ever heard Hawthorne on the radio, you know how hysterically funny, crazy, corny, weird and wonderful he is. If you haven't, well, are you in for a treat! He is famous for messing up the records, slowing them down, speeding them up, scratching the needle across them when he gets bored, or just stopping them altogether, any time he feels like it! And his sponsors fare even worse, as he abuses their "stinking spots" even more than the music. But it makes you listen, and laugh...and along the way, hear some really great music. 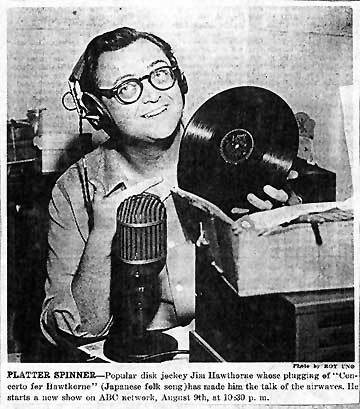 On his KXLA show, he played lots of Homer and Jethro, Buddy Baker, Spike Jones, Red Ingle, Slim Coates, and alongside them, played antiques like Prince's Band, Arthur Pryor, and Billy Murray! His playlists are as eclectic as his cast of characters, most of which he voiced himself. Hawthorne's eternally inept engineer, Eggbert, his sidekick Skippy, his paper friend Scrappy, Cosmo, plus many others all made up his crew. 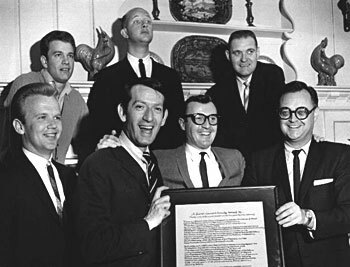 To hear a vintage KXLA Hawthorne show is as funny today as it was originally, if not more so, and is a refreshingly creative and oddly decadent change from modern radio shows. To hear his "straight" shows is a pleasure as well, as he still injected his one-of-a-kind brand of humor into his seamless sets. His later recreations (in the 1980's and 90's) of the original KXLA show are marvelous, and amazingly, just as funny as the 1940's shows. Once you hear any of his radio work, it's easy to understand why he was so successful- he revolutionized a stale medium and created the genre of "personality" radio! He is definitely one of radio's first unique personalities. 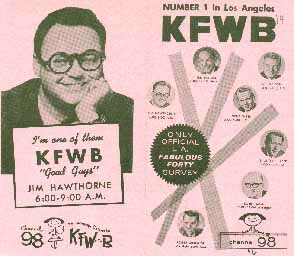 Hawthorne with the on-air personalities of KFWB, circa 1961. 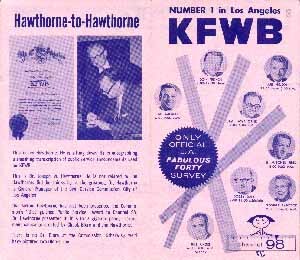 There are very few surviving transcriptions of Hawthorne's radio shows. If you have any old Hawthorne airchecks, films, magazine articles, photos, or recordings PLEASE SHARE THEM! If you would like to hear a tiny bit of hogan, go to our "Soundhogans" page, or e-mail us at petquality@sbcglobal.net for more info.